This is a real time PvP game. Players have to conquer most of the available space on the map within the limited time. 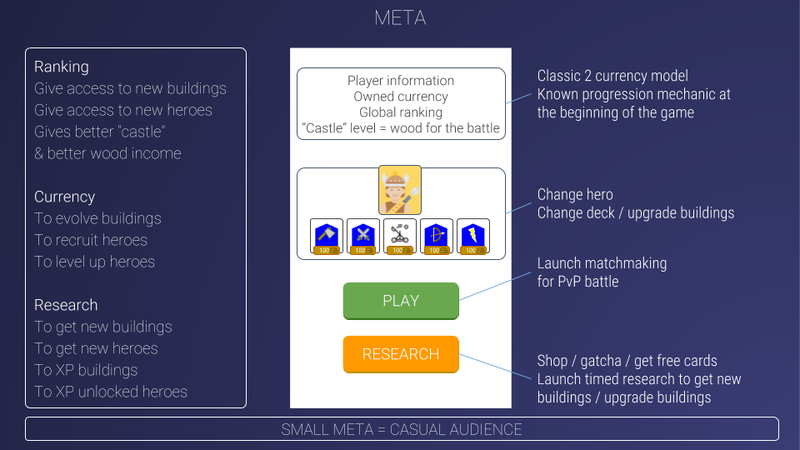 The mechanics are inspired by Clash Royale: the players drag and drop buildings on the map that will produce units automatically. Unlike Clash Royale, the players can drop their units anywhere on the map. Moreover, harvesting wood / ressources is necessary to win the battle. Within that limited time, the players have to balance their buidlings between harvesting and fighting units. If a player clearly dominates the field, he will win the battle even before the end of the timer. Players unlock multiple buildings and have to build a deck of 5 for the battle. Unlike in CLash Royale, the cards are always visible and are not randomly sorted. This gives more strategy and control for the player. The variety / randomness comes from the level design: maps are procedurally generated so each battle is different. Since the players can drop cards anywhere on the map, they don’t get an advantage from it. A special commander unit gives a passive power to the units: it helps to put more variety in the strategy building. 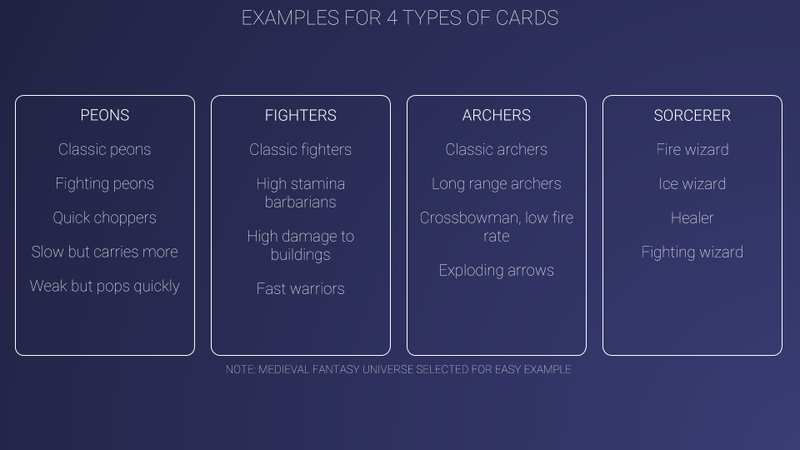 Here are some examples of units: they can have an interesting diversity. The game relies on a classic gatcha game mechanic, for buildings and for special units. The progression is a proposition of a new hybrid system: a hard currency will be used to get new cards and to accelerate timers, while getting some xp for some troops can be done with rewarded ads. 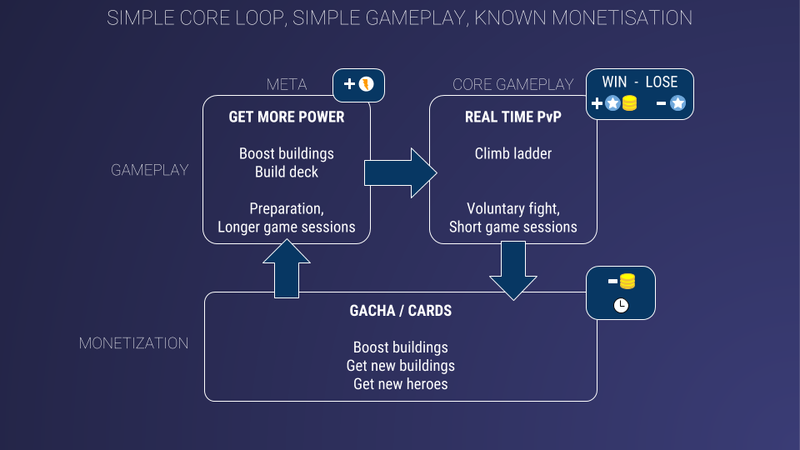 The global progression takes the ladder mechanics from Clash Royale, changing the settings for the player to see the evolution. 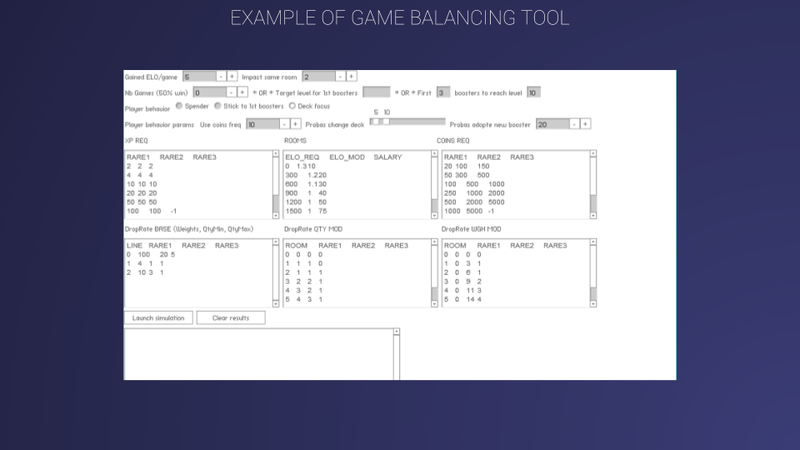 Tuning this kind of game requires taking into account lots of variables: the cost of the evolution, the rarity of the cards, the frequency of the rarity, the xp needed to evolve the cards… I made a tool for a previous game to take that into consideration. Using player personas/behaviors helps to get first tuning values. Of course, this is a draft, it needs to get fine tuned during the soft launch process.